GAA FANS DID not need to shell out for an expensive annual subscription to see Saturday’s hurling classic between Waterford and Kilkenny on Sky Sports. If they wanted to watch the game from the comfort of their own home, they could have done so for as little as €10. That’s the view of Croke Park commercial and stadium director Peter McKenna, who responded again today to criticism of the GAA’s deal with the pay-TV giant. McKenna hit back at former Offaly hurler – and RTÉ analyst – Michael Duignan who continued his vocal criticism of the Sky deal last weekend. “My father’s 83 years of age, a savage hurling man. Why should he have to go the pub, he doesn’t go the pub, to watch a match?” Duignan said. Although the Semple Stadium qualifier was screened exclusively on Sky Sports, the broadcaster also offers a day pass to its sports channels for €10 a day. Speaking on The Pat Kenny Show on Newstalk, McKenna said, “Michael’s entitled to his opinion. I think the issue we take very much is that that piece lacked balance. “Michael is an employee of RTE, he’s paid to be an analyst. Is it particularly fair that that comment is allowed to carry without counterpoint to it? You can get a Sky Now product, you could have seen that game for €10 if that was your real intent. The irony is that Michael tweeted the day before about sitting down to watch the Lions match, so he has Sky, so it seems to be a curious position to have taken. Speaking on the Sunday Game, Duignan said that “there’s enough money in the GAA”, and that the decision to move certain games off free-to-air TV and award an exclusive rights package to Sky was “disgraceful”. 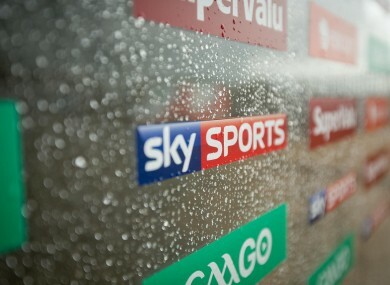 McKenna said: “With GAAGo, we sell subscriptions, and Sky give us the match coverage free. RTÉ are a 50% shareholder in that. Anyone watching the game in Auckland would have had to pay the subscription, and pay the subscription to RTÉ and ourselves as the other shareholder. It’s a complicated issue. “We get about €2.5m from government every year to run our games, but with sponsorship and everything else, we need that have games development officers, to put investment into Tullamore in Offaly, the new Páirc Uí Chaoimh, Croke Park and so on. In total, we would reinvest 92% of all the income we get in. It’s not as though there’s massive shareholders sitting in Croke Park and running away off with it. It’s about creating a small economy which is the GAA in order to look after ourselves. Matches must have a value for a pay-to-see service to buy them, and obviously the Waterford game had huge value. That was selected at the start of the year. Nobody knew what that game would be. It just happened to be one of the greats. McKenna remains open to the idea of renewing the partnership with Sky when the current deal expires. – First published 12.49, 13 July. An earlier version of this article incorrectly stated that Waterford v Kilkenny was played in Nowlan Park; it was played in Semple Stadium. Email “'You could have seen that game for €10': GAA boss hits back at Duignan's Sky Sports criticism”. Feedback on “'You could have seen that game for €10': GAA boss hits back at Duignan's Sky Sports criticism”.